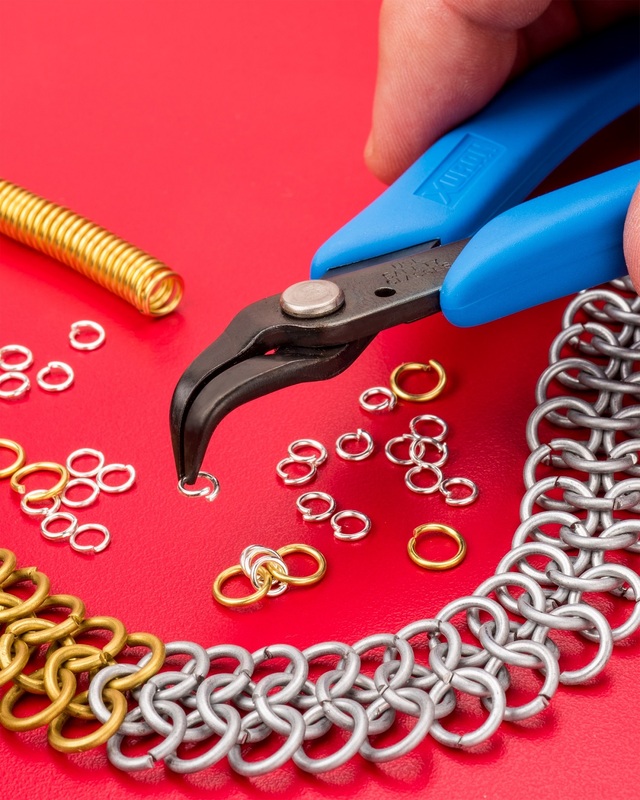 A new 90 degree bent nose pliers for working on chainmaille and similar projects requiring a tool for picking up, holding, and forming tiny rings, wire, and clips is being introduced by Xuron Corp. of Saco, Maine. The Xuron® Model 486 90 Degree Bent Nose Pliers features precision ground tips that are perfectly aligned and ideal for handling tiny rings, wire, and clips. Designed to let users pick up tiny rings and other objects without putting any strain on their wrists, this ergonomic tool has soft Xuro-Rubber™ hand grips and an internal return spring for added agility. Allowing chainmaille makers, jewelers, and other crafters and hobbyists to spend hours working on their projects, the Xuron® Model 486 90 Degree Bent Nose Pliers is made from high carbon steel and the tips are blackened to prevent glare and reduce eye strain for easily viewing very small items. The Xuron® Model 486 90 Degree Bent Nose Pliers is priced at $22.95 (list). A full catalog of precision cutters and pliers is available upon request.